The Cannes Film Festival is best known for debuting daring new cinema, like Ryan Gosling's directorial debut Lost River or the Nicole Kidman vehicle Grace of Monaco. Meanwhile, the Cannes Film Market is a hotbed of distribution deals both foreign and domestic. There, amid titles like Kidnap and Skiptrace, the rumored Skyline sequel is gaining momentum. 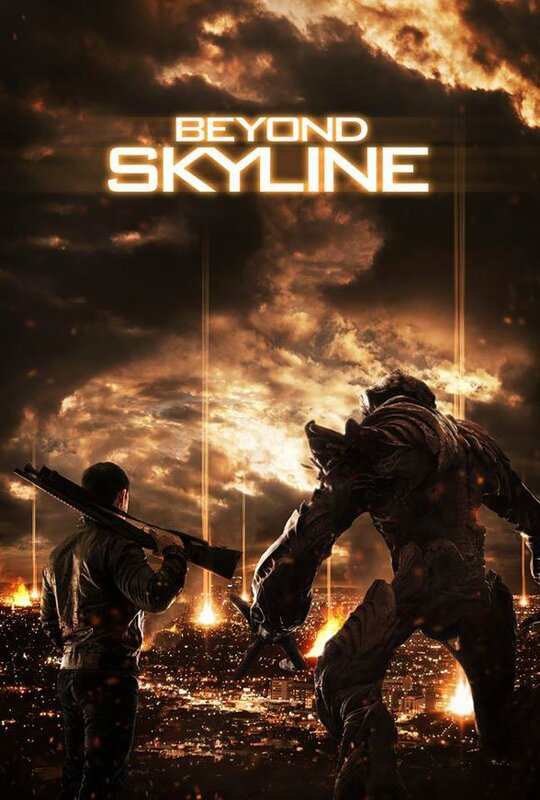 Dark Horizons has learned that a sequel to the 2010 low-budget sci-fi thriller Skyline is being sold overseas. Called Beyond Skyline, this film will presumably continue the alien invasion premise of the first film, but this time without The Brothers Strause at the helm. Instead, Skyline producer and co-writer Liam O'Donnell has been brought on board, marking his directorial debut. No details on the plot have yet been released. But the above sales poster has been shared on Facebook. Greg and Colin Strause are special effects artists who crafted a career in visual effects with films like Galaxy Quest, 300 and The Incredible Hulk on their résumés. After a series of shorts, the pair made their feature directorial debut in 2007 with Alien Vs. Predator: Requiem, which earned critical scorn but $128 million worldwide. The Brothers Strause offered Skyline as their follow-up, a film that hit kind of close to home considering two of its main characters (played by Eric Balfour and Donald Faison) are special effects creators. Once more, their film was hated by critics, but did well at the box office. Skyline was a slim-budgeted $10 million thriller that pulled in between $66-78 million worldwide (depending on whose figures you favor, Box Office Mojo or The Numbers). Even without the support of critics, an ROI this good pretty much guarantees a sequel. But no reason for The Strauss Brothers stepping out of the director's position for Beyond Skyline has been offered. Because she's pregnant, the aliens spare Elaine from having her body harvested for brains (for now anyway). But Jarrod's brain is quickly plucked, his body chucked away as trash. However, his brain is red where all others are blue and when it's eaten by a big clawed alien, the creature shudders, and appears to be overtaken by Jarrod's brain. (Because why not?) Then he rescues Elaine, and strokes her lovingly so she recognizes his true identity. From there it seems a real battle is to begin, with Jarrod using his new alien body to defend Elaine and their unborn child. This would seem a natural point for Beyond Skyline to pick up, but the poster above seems to suggest something else. It looks like Jarrod (though not necessarily Eric Balfour) will be back, but instead of Elaine he may have a new partner for taking on the ongoing invasion. That's our guess anyhow. No release date has been announced for Beyond Skyline.